Get a free workout with Spring Training in Dilworth Park, presented by Rothman Institute! On Tuesdays, Wednesdays and Thursdays, April 4-May 25, join in on a variety of sports and fitness programs, conducted by experts in the field of personal fitness from Optimal Sport Health Clubs. Yoga, Zumba, fitness boot camp, running- it's all here to get you informed and in shape for spring and summer. Plus, all season long, you can fuel up with healthy offerings from the Dilworth Park Café. Visit DilworthPark.org/springtraining/ for class schedules, discounts from Center City athletic clothing and accessory retailers and tips from fitness experts. Take a moment to breathe, relax and quiet your mind midday while building up muscle, strength and balance. Be sure to bring your own mat. Each and every Wednesday, lace-up your running shoes for a 3-5 mile trek through Center City. Meet at Dilworth Park near the information center. Push the physical limits of your body with these total body workouts conducted by top-notch trainers from Optimal Sport Health Clubs. Zumba lets you get your body going with this all out, super calorie-burning dance party set to Latin and pop music hits (powered by Live Nation). Silver Sneakers offers fitness fun for Boomers and beyond through a variety of exercises designed to increase muscle strength, range of movement and activities for daily living for seniors. Join Master Jingshan Tang and his students from the Oriental Fitness Institute in celebration of World Tai Chi/QiGong Day and Earth Day! All are welcome to participate! Dilworth Park is Ready for Spring! 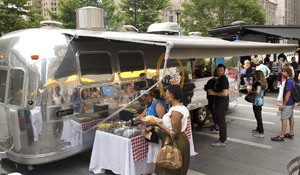 Dilworth Park's Air Grille opens for the season on April 1, serving up burgers, melts, falafel and more to park goers from 11am-4pm, seven days a week. The chefs at Brûlée Catering will also bring new items like the Race Street Fried Chicken Sandwich with Gochujang-Siracha and Pickled Vegetables, plus rotating features and seasonal specials like the classic Crabby Beach Fries and their new Char-Grilled Flatbread series - coming soon. Also, the Dilworth Park fountains will be turned on April 1, marking the return of warm weather fun, right alongside historic City Hall! Logan Square Café, 8am-5pm, seven days a week. Children's Discovery Garden and Imagination Playground, 10am-6pm, seven days a week. NOTE: The Imagination Playground will close on April 23 for the reinstallation of the Boat Pond, which opens April 28.